lower than usual due to the drought. Even though ground water is lower that usual, so far it is not a critical risk to the city water supply. The wells are both about 400 feet deep and the water level is still close the surface but now 5 to 15 feet lower than usual. Seeing the affect of the drought on the Bishop water supply makes this a good time to remember what can be done to conserve this precious resource, and save money too. Most people in California are affected by mandatory 20% reductions in water use. Although these mandates do not affect City of Bishop water customers due to the small size of the city, water conservation is still strongly encouraged. climate. Reducing the amount of water used protects ground water levels in the Bishop area and reduces the amount of electricity needed to pump the water out of the ground. Reducing electricity use to pump the water saves money so water rates can be lower. Water Mornings: In most cases watering in early morning is best to get the water to your plants and lawn. Whenever you choose to water, avoid watering in the heat of the day. Adjust Sprinklers: Well adjusted sprinkler heads and properly timed automatic sprinkler controls waste less water. Check your sprinkler heads to make sure water is going just where it should and check your automatic controls to make sure the time and duration your sprinklers operate is right. Consider a “smart timer” for your automatic sprinkler control that adjusts for the weather. Thirsty Plants: Landscaping with native plants and other plants that aren’t so thirsty is becoming more popular. Swapping your thirsty plants with ones that are less thirsty (and still look great) will save a lot of water. Indoors: Most Bishop water is used outside but saving water inside can add up too. Don’t leave water running if you don’t need it and replace fixtures with water saving types. Incentives: The City of Bishop offers water conservation incentives to its customers in the forms of giveaways and rebates. Saving water saves money, reduces water rates, protects groundwater, and is the right thing to do. Contact the City of Bishop Department of Public Works at 873-8458 for more information on water conservation and the City’s water system. On Tuesday, July 22, 2014, at approximately 4:08 P.M., two California Highway Patrol (CHP) Officers assigned to the Mammoth Lakes Resident Post were completing a traffic enforcement stop when they were flagged down by a concerned citizen who was reporting a possible traffic collision. The CHP officers responded to Crowley Lake Place, just east of US Hwy 395 and located a vehicle in a culvert off of the roadway. The officers contacted witnesses at the scene and based upon witness statements the officers responded to an address on Crowley Lake Drive. There officers located Ms. Ashley Mull. While speaking with Ms. Mull one officer detected the odor of alcoholic beverages emitting form Ms. Mull’s breath and person. Based on physical evidence and witness statements, the officers determined Ms. Mull had been operating the involved vehicle under the influence of alcohol. The involved vehicle was locked and left at the scene of the incident. Ms. Mull was arrested and transported to Mammoth Lakes Hospital to complete a chemical blood test. After completion of the chemical test Ms. Mull was transported to the Mono County Jail and booked for driving a motor vehicle while under the influence of alcohol. Officers form the Mammoth Lakes Police Department and deputies from the Mono County Sheriff’s Department assisted the California Highway Patrol with this incident. On July 22, 2014, at approximately 2:50 PM, Mr. Andrew Hickey was driving a 2001, Dodge, Durango, northbound on US highway 395, south of Swauger Canyon Road at 55 miles per hour. A shoe box size rock began to roll from the southbound dirt/rock embankment and across the highway. The rock rolled into the northbound lane causing Mr. Hickey to take evasive action and steer the vehicle to the left. This action caused the right rear tire to strike the rock causing Mr. Hickey to lose control of the vehicle. Mr. Hickey steered the vehicle to the right, causing the vehicle to leave the roadway and come to rest on its left side. Mr. Hickey and Mr. Bradley Naughton, who was the right front passenger, were not injured. California Highway Patrol officers were assisted at the scene by Mono County Paramedic Fire/Rescue, Medic 7 (Bridgeport), Bridgeport Fire Department, and the Mono County Sheriff Department. The Bodie Fire has been declared 100% contained. The fire was accurately mapped at 93 acres. The fire was located on public land administered by the Bureau of Land Management Bishop Field Office and started the evening of Friday, July 18. An investigation determined that the Bodie Fire was a lightning-caused fire. The fire was approximately four miles to the southwest of the Bodie State Historic Park and was between the state park and Mono Lake. Approximately 200 firefighters responded to the suppression response. Crews represented Bureau of Land Management, US Forest Service, and Cal Fire. 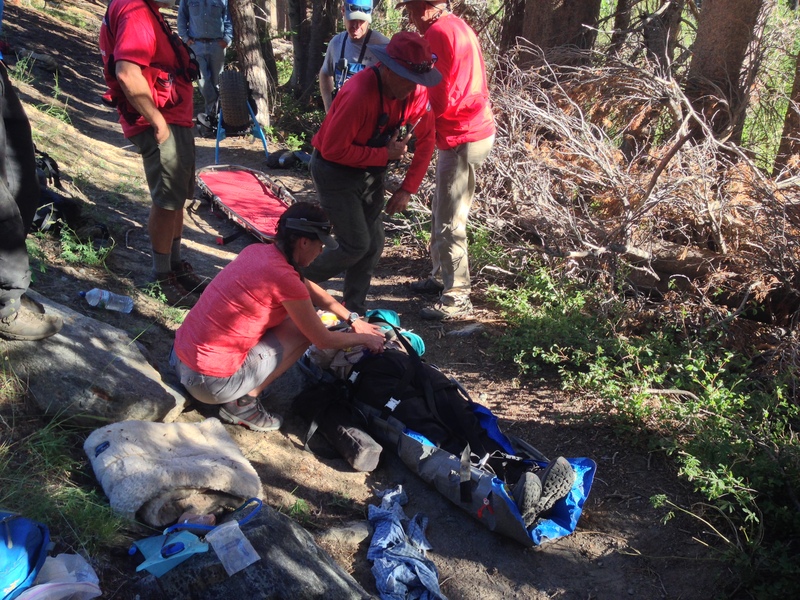 On the afternoon of Friday, July 18, 2014, at approximately 3:00pm, Mono County Sheriff’s Dispatch received a call regarding two injured backcountry pack trip participants. A multi-day guided pack trip was returning from their trip, when approximately 1.5 miles from the Agnew Meadows pack stations, two mules became spooked and the riders were thrown from the mules. The Mono County Sheriff Search and Rescue (SAR) team responded to aid the two injured riders. One rider suffered a bruised leg. The other rider sustained serious injuries. Eight SAR members hiked in and stabilized the seriously injured rider for evacuation to the trailhead via a wheeled litter. Mono County Paramedics met with SAR team members and the victim and transported them by ambulance to Mammoth Hospital for treatment. The series of storms that passed over the Eastern Sierra last week have caused damage to the several roads in the White Mountains. Summer thunderstorms brought heavy rains to some areas of the White and Inyo Mountains, where road washouts have occurred. Roads in the Crooked Creek drainage, including the Crooked Creek Road (Road 05S01), the Cottonwood Road (Road 35E315) and the Wyman Canyon Road, require skilled travel on dirt mountain roads. The Forest Service is completing repairs on forest service roads. Visitors should take precautions when travelling on dirt roads and report any road damage to a US Forest Service office.